I saw the ocean today, but didn’t walk on the beach. I see the water and think about the water every day. I had wanted to use this photo another day so here it is today. I love the contrast of textures and colors. I love that the foam is etherial and changing and will disappear. 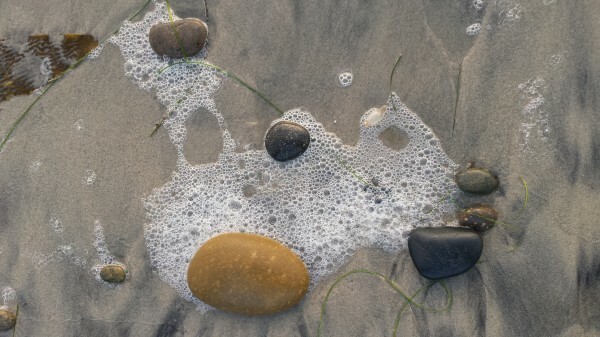 It seems to be bathing the stones, as if it were soap bubbles. The next wave may be the rinse cycle! We went to the Safari Park. We fed acacia leaves to the giraffes. We saw gazelles and deer and rhinoceros and a camel and some wild horses and sheep and condors and owls and flamingos and…it was cold (=cool) and breezy and even drizzled on us. Many of the animals we saw are endangered species. Rhinos are hunted for their horns, which have been used medicinally for centuries. Turns out they are the same substance as fingernails and hair, and have no proven healing components. Sigh. I wore a hat and scarf and gloves and a jacket and sweater and pulled on my turtleneck as an insulating layer for the second time since we moved here. It felt like an adventure to be that cold. Hah! The midwest was in single digits with snow. Our visitor escaped at just the right time, leaving a foot of new snow behind. We all had a grand time. It was our son’s 21st birthday, glorious day in so many ways. It would have been wonderful to have shared this day with him. He is there, we are here. Perhaps he will come with us to feed acacia leaves to the giraffes next time. He, too, will laugh with pleasure!